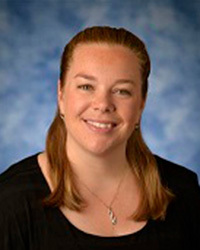 Jenna Street is the coordinator of Sports Medicine Clinic Operations for the United States Olympic Committee (USOC). After finishing her master’s degree, Street completed a Sports Medicine Fellowship with the USOC, where she’s worked full time since 2009. She currently works in a clinical setting with both Olympic and Paralympic athletes, and routinely travels internationally with Paralympic teams to events, including the 2014 Summer Youth Olympic Games in Nanjing, China, 2012 Summer Paralympic Games in London and 2016 Summer Paralympic Games in Rio De Janeiro, Brazil, in 2016. In 2013, Street was a keynote speaker at Michigan State University’s College of Osteopathic Medicine Sports Medicine Conference, where she spoke about Olympic sports medicine. She is based in Colorado Springs, Colorado. She currently serves on the National Athletic Trainers’ Association Young Professionals’ Committee and the Board of Certification’s Continuing Professional Working Development Working Group. Jenna Street teaches the Sport and Disability and International Athletic Training courses. She brings to the online classroom her clinical expertise and myriad experiences across elite sport platforms (including Paralympic athletes) and around the world from traveling as the main medical provider for many athletic teams. She gathers her best practices during her role as manager for the USOC Sports Medicine Volunteer Program, which allows her to continually learn from both her colleagues and medical providers who volunteer from all over the country to provide care to elite athletes.